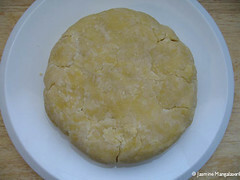 By the latter half of the 1800s, the egg custard evolved into a frangipane-like filling; since then the quantity of jam decreased while the almond filling increased. 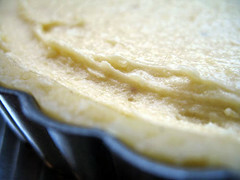 This tart, like many of the world's great foods has its own mythic beginnings…or several mythic beginnings. Legend has it in 1820 (or was it in the 1860s?) Mrs. Greaves, landlady of The White Horse Inn in Bakewell, Derbyshire (England), asked her cook to produce a pudding for her guests. Either her instructions could have been clearer or he should have paid better attention to what she said because what he made was not what she asked for. 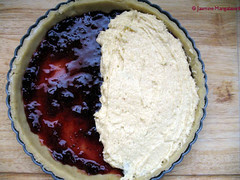 The cook spread the jam on top of the frangipane mixture rather than the other way around. Or maybe instead of a sweet rich shortcrust pastry case to hold the jam for a strawberry tart, he made a regular pastry and mixed the eggs and sugar separately and poured that over the jam—it depends upon which legend you follow. Regardless of what the venerable Mrs. Greaves’ cook did or didn’t do, lore has it that her guests loved it and an ensuing pastry-clad industry was born. The town of Bakewell has since played host to many a sweet tooth in hopes of tasting the tart in its natural setting. Bakewell tarts are a classic English dessert, abounding in supermarket baking sections and in ready-made, mass-produced forms, some sporting a thick sugary icing and glazed cherry on top for decorative effect. Enjoy it with a cup of tea or coffee or just eat it sneaky slice by sneaky slice until, to your chagrin, you realise the whole tart has somehow disappeared despite you never having pulled out a plate, fork or napkin with which to eat it. Is it a tart or is it a pudding? It’s a debate that rages on and we aren’t taking sides on this one. But we will say that many people call this pudding a tart. The etymology of pudding is a rather interesting and slightly convoluted one. * The naming confusion may come from the British manner of referring to the dessert course as ‘pudding’ (as well as referring to fat babies by the same name, though we don’t think that is what was the inspiration in this case). And so any dessert is a pudding until another name comes along and adds clarity to what it really is. * nb: Annemarie had to electronically restrain Jasmine from delving into another treatise, threatening to remove her digital scale, personally autographed copies of How To Eat by Nigella Lawson and A.S. Byatt’s Possession and toss her kitchen footstool into the squidgy marsh up the road (really…Jasmine’s kitchen appears to be designed by a 6’4” fast food-eating engineer named Martin, Chuck or perhaps Buford) Anyone interested in hearing or reading her wax lyrical about puddings should just email her directly. Special thanks to my dear Annemarie and Ivonne and all the DBs who put together the tart--thanks so much for everything. 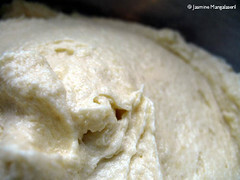 Click here for a list of participating Daring Bakers. I can't wait to try it tomorrow, as I wait to the last minute as always. Thanks for the pick, I had never tried this tart...er...pudding. Great challenge, thanks for hosting and bringing us a lovely light dessert! Jasmine, dear Jasmine! Your tart looks just super. What a wonderful challenge!! This was so much fun to make and even more fun to eat. 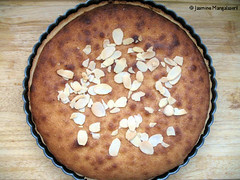 Everyone loved it and for me, it was the first time hearing or making frangipane. I only know the flower Frangipani. Superb dessert, superb challenge and a superb host! Thanks so much! Thank you for this wonderous challenge I really love it - it's delish and so simple and tasty!!! I really like your series of pixs on the blog very informative and the final result is excellent and thanks for all your feedback in the forums. Hope you had fun being the hostess with the mostness!!!!! Thank you so much for picking this tart and hosting the challenge. One more new food discovery for me, and the first time I made a frangipane (and an eggless one too). Thank you for hosting this month's (my first) Daring Bakers! I enjoyed the challenge thoroughly, it was very well designed. Jasmine, thanks for hosting a great challenge! This tart.. pudding... was a new one on me and I really had fun with it. Thank you Jasmine for this challenge! It was not too easy, yet easy enough to take care of the details! I enjoyed baking this tart... er... pudinng very much! Thanks for the great challenge. This is one of my favorite Daring Bakers recipes yet. It came out so well - I will make it again and again! Thank you so much for choosing such an amazingly tasty challenge! The very clear and detailed recipe and instructions as well as the photos were a huge help, and I totally enjoyed the process and the end-result. It was a great challenge! Thanks so much for hosting and picking such a great recipe. I really loved this one! Your tart looks just beautiful! Thanks for hosting I really enjoyed this challenge. Beautiful tart! Thanks for hosting this challenge =D. Thank you for a great challenge..everyone loved the tarts! Yours look incredibly beautiful and delicious! Thanks Jasmine for this wonderful challenge It is the first time I hear of Bakewell tart er pudding, the first time I bake one and I already love it. Your tart looks lovely. Thanks for hosting such a delicious challenge! Thanks Jasmine...This challenge was delicious. Thanks again to you and Annemarie for this month's challenge! Thank you for a great challenge! I love baking things I have never heard of before and this was my first DB opportunity to do that. Thanks SO MUCH for a fantastic, delicious challenge! YOUR tart photographs are wonderful! this was a good one!! Love it in spite of my mishaps! hahaha!! Fabulous recipe! Thanks so much for picking it! Thank you so much for hosting this challenge. I imagine it's quite a time consuming and nerve racking thing to do.I enjoyed it immensely. Yours looks lovely. Thanks for this challenge. I just polished off the last slice for Sunday morning breakfast! Thank you so much for this challenge - I learned a new skill (vegan frangipan), and it was just a joy to make and to eat! Thanks so much for hosting such a great challenge! I was excited about this when I first saw it and it was incredible. So tasty! I used lemon curd and I must say that it tastes amazing! Thanks again. Jasmine, this was a GREAT pick. So easy, but rave reviews all around. Great choice for this month's challenge! I really enjoyed making the Bakewell Tart. Yours looks wonderful! Thank you for hosting this great challenge! It was nice to make something different, and I really enjoyed it! This had been on my list forever! I bow to your tart! Thanks very much for this one. Thank you Jasmine for hosting this Challenge. It's a nice recipe to have in one's repertoire. Wonderful choice for baking challenge. Looks and sounds really delicious. Thank you for hosting Yasmine. THis was a fun challenge, and I've learn something new about this tart that otherwise I never knew about. thanks for a great recipe! i really enjoyed making (and eating) my first bakewell tart!! I want to thank you for this wonderful challenge! I really loved it, and will definitely make this again, with no end of variations! Thank you! I enjoyed it ... am still enjoying it in fact. Thank you so much! I know that you put in loads of effort and it showed. Your recipe was tremendous and the result was delicious. And I have finally made a Bakewell Tart. Happiness! Thanks for hosting a fabulous challenge! The tarts received rave reviews at the BBQ I brought them to. Thanks so much for hosting this month! It really is a wonderful recipe. And, I am sure I will make it again. Yours turned out great! Thank you for hosting! I absolutely loved this challenge. Thanks for hosting such a fun challenge! It was a delight to try this new English dessert! Thank you soooo much for the fabulous challenge Jasmine.. This recipe is definitely a keeper! Jasmine, thanks for a wonderful challenge this month. Even though I haven't had a chance to post about mine yet, I want to tell you this is absolutely the BEST Bakewell Tart recipe I've ever used. It was the perfect challenge to close out my Daring Baker career on. Beautiful! That was a great challenge! Thanks for the wonderful Bakewell tart recipe! Thank you, thank you, thank you and thank you again for this great challenge. 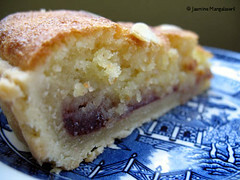 I'm in love with hazelnut frangipane and with Bakewell tarts in genereal and I didn't know about them till this mounth!!! Thanks so much for coming up with this challenge! I loved making it (although it was a bit challenging with the temperatures here) and the taste was absolutely delicious! Never tried bakewell before (had never even heard about bakewell before) so thanks for this!! Jasmine thank you for the lovely challenge. I had a great time with it! Your tart looks amazing! This was a great challenge, thanks for giving me the opportunity to try something new! I'm marking this as one of the tastiest challenges I've participated in in the 33 months I've been a Daring Baker. Wonderful choice! Jasmine, thanks for hosting this challenge and introducing me to the Bakewell Tart! Thanks so much for a simple tasty and new tart recipe, I really enjoyed preparing and eating it. Thanks for hosting such a wonderful challenge! I'm very glad to have been introduced to Mr. Bakewell. Thanks for the wonderful challenge and for stopping by my blog! I think I need to hear the story! Thank you for a great challenge. We sure loved it. It was on my to do list. How cool is that? Thank you for hosting a great challenge. Jenny (of All Things Edible) and I finally made it. Thank you thank you for a great challenge! 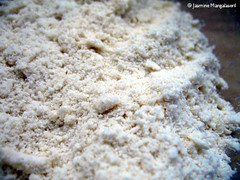 This was my first experience with almond flour and I LOVED IT! Thanks for introducing me to it! Thanks for a wonderful challenge that even a non-baker like myself could do! 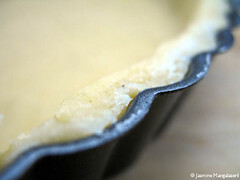 And thanks for stopping by my blog to comment on my tart/pudding. Thanks for hosting the challenge. I had a lot of fun with this one, and your enthusiasm for the tart is great. 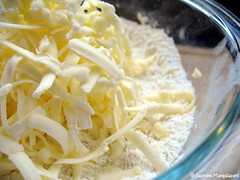 Your pictures are gourgeous, especially the one from above with the scattered almonds. Thank you Jasmine for the great challenge!